It has always been felt that for a language to survive, it should have its own script. It cannot remain only as a spoken language for long. But of course, the script need not be peculiar and specific one pertaining to that particular language. So too is the necessity of a script for Badaga. Many have attempted to achieve this objective with various degrees of success. But unfortunately, to my knowledge, no records exists, if any. I am no expert on phonetics or languages or much less innovating an unique script. But the urge to have a separate script has convinced me that it is very much possible to ‘ADOPT’ an existing script and ‘ADAPT’ it to Badaga language. When I offered to publish his ‘Badugu Script’ in our websites and requested him to send the details, Anandhan has accepted my offer and has sent all the details. My father was a schoolmaster and I received an excellent education in my childhood, attended a polytechnic, where I had my Diploma in Mechanical Engineering and worked as an Instructor in Mechanical Engineering. I wrote and published a book entitled “A Descriptive Grammar of English Words” in 1999. Prior to this, I wrote a piece of poetry called “The Breeze” in imitation of “The Brook” by Lord Tennyson, which was my contribution to the magazine of the school, where I had been working then. As to the grammar, I have added some more chapters, rewritten few, and revised several. The book is now given a new title “A Descriptive English Grammar“and is in print and will be published soon. I also became interested in computers, did an Honours Diploma in Computer Applications, and at present, I am working as a Computer Science Teacher in a Higher Secondary School. I have written and published a book entitled “A User-Friendly Guide To Computer Science” in 2009, prepared in accordance with the syllabus prescribed by the Government of Tamilnadu for students of class XII. But I still teach English. As a school child I grew up listening to my father’s singing some of the classical English songs such as The Brook and Sweet and Low by Alfred Lord Tennyson, The Swing and The Block City by Robert Louis Stevenson and The Swallow by Christina Rossetti and Little Raindrops by Caroline Hawkshawe and Frogs At School by George Cooper and Fairies By The Sea by Rose Fyleman and so forth. My love for the English literature and my love for singing have inspired me to make an attempt at singing these songs with what little resource I have. They are songs without music. It is my wish to see that these same songs are sung by me with musical accompaniment. I hope these songs will indeed entertain the world one day. Please visit http://www.MusBook.com to listen to my singing. 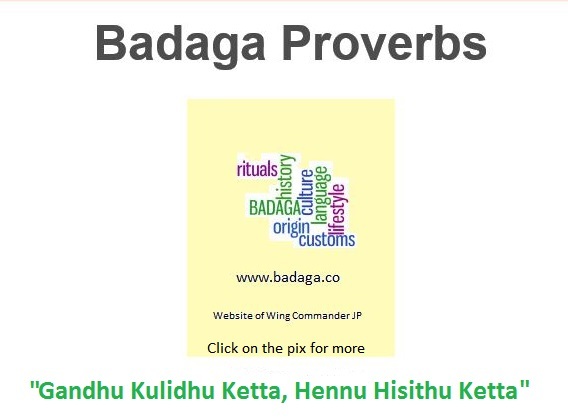 It gives me great pleasure to announce that I have developed an alphabet for Badugu, a language hitherto without a writing system, spoken by a member of one of the native peoples of the Nilgiris called Baduga. What is more, I have created a true type font and named it BaduguAnandha using a computer program. Inspired by my father Sri.R.Raju son of late Sri B.Ranga Gowder of Thangadu Oranaai, I took to researching the Badugu language, my mother tongue. Studying the phonology of Badugu had indeed been a labour of love to me. Though a Baduga, I learned Badugu afresh in order to have a very good understanding of the system of sound patterns of the language, which later proved to be a groundbreaking piece of research. It would be ungrateful if I did not acknowledge Rev. Philip Mulley for his help during the research. What I discovered was a notably unique feature of the Badugu vowel system. It is the presence of Retracted Vowel sounds. I call them so, because when articulating these vowels, the tongue retracts automatically. It is my contention that the Retracted Vowel sounds antedate the Retroflex sounds. It can clearly be seen that a presumptive pattern of sound change had occurred over the years. The Retracted Vowel sounds found the Retroflex sounds as their complementary sounds i.e. retraction of the tongue by natural process complemented with flexion of the tongue resulted in retroflexion of the tongue. It is evident that when you articulate a vowel sound that immediately precedes a retroflex sound the tongue retracts giving way to flexion naturally. From the foregoing, it is quite possible to say that Badugu is one of the Proto-South-Dravidian dialects that has undergone separate linguistic development despite the fact that it resembles Kannada in certain correspondences jointly in sound and in meaning. It is to be noted that Badugu shares such systems not only with Kannada but also with other Dravidian languages too. Badugu is a separate language having a typical phonological structure. The autonomous status of Badugu has been hinted at in “Language and Society in South Asia by Michael C.Shapiro and Harold F.Schiffman, 1981:100”. A separate language suggests a separate alphabet specially developed for it. Some people might quickly call this idea into question. They might ask Why a new alphabet for Badugu? Aren’t there writing systems already in existence which can readily be adopted or adapted to represent the speech sounds of Badugu? And so forth. These questions seem reasonable. But then again without entering into details, we shall deal with the broader aspects of these questions. Suppose we adopted the Tamil alphabet for representing the speech sounds of Badugu. We know that the letters representing the consonantal speech sounds of Tamil number at 18. But the consonantal speech sounds of Badugu are reckoned at 24 which require 24 distinct letters to represent them. If the Tamil alphabet is adopted, it could only incompletely represent the speech sounds of Badugu. Therefore it turns out to be a deficient alphabet. Again, suppose we adopted the Kannada alphabet. The letters representing the consonantal speech sounds of Kannada number at 34 compared to 24 of Badugu. Therefore the Kannada alphabet is redundant. We can easily conclude that the question of adoption seems unreasonable. Moreover, modification will not always bring about certain desired results. Most likely, in the middle of the process of modification, the letters would defy further doing and develop awkward shapes. Therefore the question of adaption also seems unreasonable. It is my conviction that Badugu must have a separate writing system because it is a separate language. 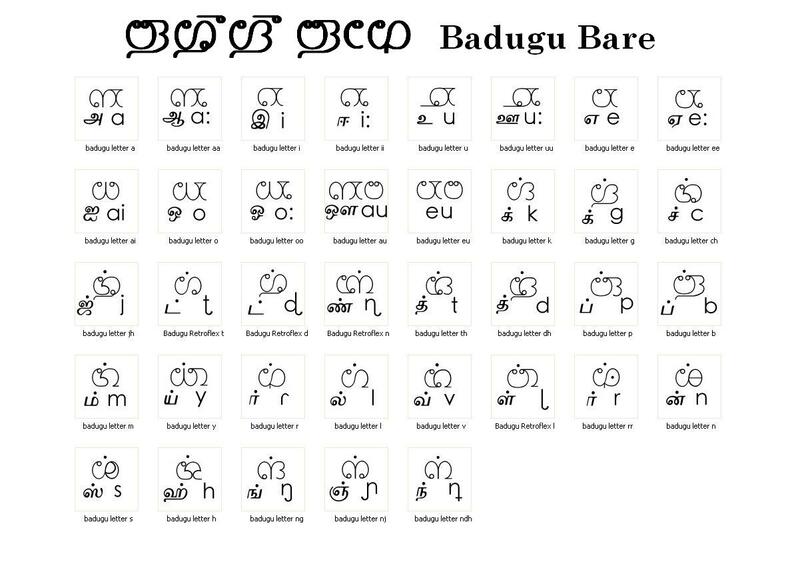 I hope every Baduga would proudly welcome the development of the Badugu Alphabet and the creation of a Badugu Font and use them to read and write Badugu henceforth to keep the Badugu language alive. Last but not least, I have also written a manual entitled “Keying In The Badugu Alphabet” for those who wish to learn how to key in the Badugu letters using the font BaduguAnandha.ttf. A cursory glance is good enough to convince the enormous amount of hard work he has put in. It gives me the greatest pleasure to present and share the same with you all. Before that let me congratulate Anandha whole heartedly and assure him that our good wishes are with him. 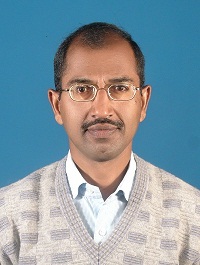 Anandhan, from Thangadu Oranaai, is presently the Computer Science Teacher in Chamraj Higher Secondary School, Chamraj. He has done his Dipoloma in Mechanical Engineering and Honours Diploma in Computer Applications. A BIG CONGRATULATIONS for scripts for Badaga. I feel really excited and FANTASTIC typing in Badugu. Went through the manual , nice work. Very easy to understand and I have started typing my name easily now 🙂 and many more words. In future I hope websites may support this FONT. 273 + 3 Consonants and 13 vowels means? Like to know the history behind this , do you write any blogs? , Please let us know. Thanks AGAIN for giving us such a wonderful BaduguAnandha font and making everyone anandha. Single Dream for everyone..!!! Wow, isn’t it awesome , great Mr.Anandan. It is indeed heartening to know that Yogesh of Kadasoley has been involved in developing a Badaga Script for the past 40 odd years. His tireless efforts, probably, did not receive the attention it deserved so far. … Mr.Yogesh.R. of Kadasoley village in Thodhanadu Seeme has come out with a script for our language way back in 1978 and people officially started learning the script from 1989 onwards. His works have come out in the “Dhina Thandhi” (Daily Thanthi) newspaper in the same year and he continues teaching the script to all interested people even today. Of late, one not-to-profit Organisation called Badaga Welfare Centre (BWC), based at Coimbatore is conducting weekly classes in the script and I am one student who has learnt it. The script is very simple, practical to understand and addresses all forms of pronunciation in Badugu language. In addition to it, Mr.Yogesh has successfully come out with the Grammar and a badaga-badaga-english dictionary for it too. He has put in no less than 40 years of his time in arriving at the script, what it is today. As on date, no less than 2000 students are learning the script online and we plan to take it to our Community through all formal and informal channels. We look forward to your support and words of advise in this endeavour. It is heartening to learn that there are a few Badaga youngsters who have dedicated a lot of their time and effort to the development of Badaga community in general and Badaga Language in particular. One such youngster with some original thinking is <strong>SARAVANA KUMAR </strong>son of K.J.RAJU, a lawyer from Karimora, presently staying at Coimbatore. I have interacted with him quite extensively and feel some of his ideas could be far reaching. This boy is gifted with intelligence and is sure to make us all very proud. I strongly feel that, for Badaga to survive in future, a separate and unique script is a must.Saravana is developing a script for Badaga which is more of pictorial representation that reminds one of the 'Hieroglyphic scripts' seen in the Pyramids of Egypt. It is really nice to see our evolution over period, and getting into the era of computers, where such an introduction will spread quite quickly, and all our support to use this will definitely help our community grow. As a child in early school days in Kochi, I too remember writing something similar for all letters corresponding to Hindi alphabets and gave it to my father, asking him to somehow let everyone know we found a new script. Well, I had no idea of what I was talking about, except that I didn’t want to say we had to depend on an existing script when our language was our own. But I understand that the script need to be registered and marked as recognized to take it to the next level of acceptance and making part of school curriculum, at least for a few classes in our hatti schools. This is mainly useful and will lay a history for the coming generation. Many of our unsaid and unknown stories of past and experiences of our community shouldn’t go unseen by anyone, just because we are not too many as others. Let me know if you might need any support from my end. Currently I live in Singapore, and I can try to help you if you need anything from my side. Hello SofiaJoghee, How do you do? It is heartening to read your message. Thank you very much for coming forward to offer your help and support. The Badugu script must be taken to the next level, as you have rightly put it. I also intend to compile a Badugu-English Dictionary. Besides my continuing research on Badugu, I write and publish books on English grammar and Computer Science. I do the latter on a very small scale, that is, Print-On-Demand business. I have made these two my special province. Though I have spoken my mind, I am at a loss now as to what kind of help I could ask of you. 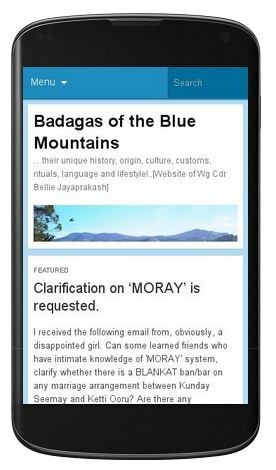 I am very pleased to announce that I have developed a writing system for Badugu, a language hitherto without a writing system, spoken by a member of one of the native peoples of the Nilgiris called Baduga. What is more, I have designed a true type font and named it BaduguAnandha using a computer program. I have also written a manual entitled “Keying In The Badugu Alphabet” for those who wish to learn how to key in the Badugu letters using the font BaduguAnandha.ttf. I hope every Baduga would proudly welcome the creation of the Badugu Alphabet and use it to read and write Badugu henceforth to keep the language alive. Please follow me on Facebook to know more on the Badugu Alphabet. A BIG CONGRATULATIONS for your insofar achievements in developing scripts for Badaga. Like to know the history behind this , do you write any blogs? , Please let us know. Thanks AGAIN for giving us such a wonderful BaduguAnandha font and making everyone anandha. For FaceBook the below url should work to see the manual.